After you complete the Articulate Storyline Training, we provide FREE follow-up support. You’ll have LIVE one-on-one access to our certified instructors for a whole year when you need it. You have the option to attend all Articulate classes in person at our location in Herndon, VA, or attend remotely (live online). When you register, you will have the option to check if you prefer to attend remotely. Articulate Storyline – Level II (intermediate to advanced). We also provide training in Aritculate Studio ’13 Pro and 360 (Presenter, QuizMaker, Engage, and Replay). Our instructors are certified technical trainers (CTT+) and experienced e-Learning developers. They have practical instructional design backgrounds and great ability to teach technical subjects. Certification is provided after completing the training. In this course, we’ll introduce you to Articulate Storyline, an e-learning tool used to develop training courses for more than 80 million learners in 150 countries. You’ll explore the Storyline interface while learning to build interactive content. Learn how to plan and build Storyline projects from scratch, add scenes and slides, apply masters, and import content from Microsoft PowerPoint. You’ll add common slide elements as text, images, characters, and captions. Beyond common element basics, you’ll explore Storyline interactivity, layers, and media controls (audio and video). Finally, we’ll wrap up your Level 1 training with an introduction to variables, comprehensive coverage of quiz creation, recording, and publishing. In this course, we’ll introduce you to Articulate Studio 13 (or Articulate Studio 360) – Presenter, QuizMaker, Engage, and Replay. You’ll gain the knowledge and hands-on practice to rapidly develop e-Learning course modules, and create compelling e-Learning presentations and interactive simulations. 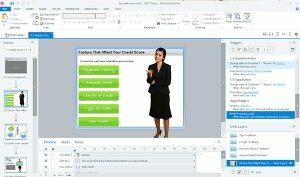 You’ll also learn how to add interactivity and narration to your PowerPoint presentations, create quizzes with Articulate Quizmaker, record full motion video demos, and publish SCORM packages.